Day 12 of our 30 Days to a Food Revolution. 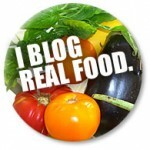 Our guest blogger today is Lauren of Celiac Teen. When faced with the diagnosis of celiac disease, Lauren of Celiac Teen turned this potential hardship into a new passion for gluten-free food. Lauren has been blogging her recipes and experiences as a gluten-free teen for 2 years. She is currently a 17 year old high school student in Canada who loves to play with flours. Lauren’s Tip: Healthy changes rather than quick fixes. The other day, while searching for my tip, a friend decided to go on the lemon juice-cayenne pepper-maple syrup-water diet. I quickly convinced her that that was in fact, not good for her. If she really wanted to be healthier, it was all about the little changes. A whole orange rather than orange juice with breakfast. Fruit as your snack when you get home rather than lots of cheese. Not buying a fast food lunch each day (even if it’s a smoothie), but bringing one from home. Eating meatless once a week. It wasn’t as though I was telling her things she had never heard before, but her eyes were wide with wonder. Healthy modifications rather than quick fixes. Simple changes rather than yo-yo diets. Good delicious fresh food rather than food that just happens to be near. The next day, she brought a bagged lunch. I know that Jamie Oliver is fighting for school lunches (among other things) that are healthy and delicious, but when people are going off-campus anyways and a bagged lunch will control what they eat and make sure that they get everything they need, it’s a good thing. The first day, she didn’t have enough to eat in her lunch, so she went to the vending machine. And although that’s not the best plan in general, my school recently got a healthy vending machine, or at least a healthier one. There are even gluten-free and kosher items, so that all of us can enjoy it (although some of the other machines do serve gluten-free things such as riceworks chips). Now, I won’t claim to be the healthiest high-school student out there, but I am very aware of my food. I have to be.I was sick for two years. Two long years. Pneumonia gave a handful of diseases the kick-start they needed to wreak more havoc in my body. First came thyroid. The crazy little thing went overactive then underactive. Then, about 6 months later, celiac (the source of my daily stomach aches) was proven. Unrelated, I have a minor blood disorder. And there are those gall stones. Teeny, tiny, sludgy gall stones, at 16. Not to mention the postural hypotension. When everyone else is racing away from salt, I have to take salt pills just to maintain my blood pressure and blood volume. Suffice to say, I have to read every label. I have to know if wheat may have come into contact with it. I also like to know how much salt is in something, because I take 1500 mg a day, and am always happy to have more. I wouldn’t suggest that you increase your salt intake unless directed to by your physician. My GP, GI and Cardiologist all said that this was a good thing for me. It lets me feel normal, rather than my arms feeling funny. They start to feel not solid otherwise. It’s weird, and bad. But we make it through. I’m still eating well, thin, healthy. So (for that one person that managed to read all of this but not the bolded tip) what is my tip? Make healthy changes, not quick fixes. Each night, we have a nice huge bowl of veggies before dinner. My brother and I will often fight over them. They are fresh, colourful, and delicious; what’s not to fight for? Especially that elusive last piece. Another great thing is a glass of milk at dinner. I even drink skim – it doesn’t take long to get used to it. I enjoy it now. We eat dinner as a family. If it’s one of those nights where people are running out the door, eggs or bean dishes are what we enjoy for dinner. Some nights, you want something warm and comforting, with cheese and tomatoes but not quite as involved as lasagna. So, here is a pasta bake. It’s warm, delicious, and all I heard as we ate was the tapping of forks against the plates. We didn’t need to talk. It was delicious. I even reheated some for lunch the next day. In fact, I’d love a bowl right about now :). Cook penne in boiling and salted water for 12 minutes until almost tender. Add in broccoli and cook for one minute, then drain. Combine the sauce, half of the cheddar, ricotta, basil and 1 tbsp parmesan in a large bowl. Toss drained pasta and broccoli. Season with salt and pepper. Place in an 11 by 7 baking dish and sprinkle remaining cheese on top. Bake uncovered for about 20 minutes, or until cheese has melted. Let rest for 5 minutes, then enjoy! More from Lauren today on her blog, Puffed Gluten Free Pancake. It's nice to get to know you a little bit through this post. You are doing amazing things at 17! And you have proven that once again, Canada is ahead of us in awareness… gluten-free items in vending machines? Yum! What a smart girl you are! I was diagnosed with IBS at 17 (14 years ago!) and just found out about 5 months ago I have a gluten allergy! All of those years in pain 🙁 So glad a co worker brought gluten intolerance to my attention. I'm still finding things to cook, and I woke up this morning thinking…. what am I going to make tonight that would be comforting and yummy AND gluten free?! I will be making this for sure! Yay Lauren! This is a great post – with lots of helpful little tips. I saw a tweet yesterday where a woman was looking for "diet tips". I was shocked. Do people really still diet? Let's just change our eating habits for the better and for life. Then we wouldn't need diets anymore! Thanks for doing so much to spread awareness Lauren! I love your writing style, Lauren. It is so impressive to see a teen so knowledgable about food and your health! This recipe sounds great. We will definately be trying this! Such a wonderful post, Lauren! Down to earth and full of common sense, just like you. 🙂 Drooling over that pasta recipe for sure! And, like Alison, I'm amazed about gf specialty items in vending machines in Canada. Those could sure come in handy in some places … like airports. Small changes are the best! Thanks so much for reminding us, Lauren. Lauren, I am a high school teacher, and I love to see how much of an impact teenagers can have on others! You are a positive role model to your friends and to everyone who wants to make healthier choices. Thanks for the tip and the recipe. I enjoy reading your blog. Fabulous recipe, even more fabulous philosophy! I've started falling for pasta bakes myself. The last time, I even did it all in a big cast iron pan–no boiling the pasta, just lots of extra water in the pan and throw it in the oven to brown some cheese over the top. We have cottage cheese around more often (and cheaper) than ricotta, so I usually throw a bit into mine. Plus, you can use the cheaper pastas (like Trader Joe's Brown Rice) instead of Tinkyada when you do a bake–it stays moist as leftovers because of the sauce integration. Way to be, girl! That is exciting that you have taken charge at such a young age. I've been cooking since I was a little girl too and I love it! I love your tips – so simple yet so true! And how convincing that its coming from someone their own age. Keep up the fun work! Luaren, this looks like it would be the most comforting, delicious pasta dish ever! Yum! And I'm with the others – gluten-free items in the snack machine? And healthy ones? Wow – I'm so impressed. Wish I had that at my office! What a great story and I'm so impressed how far you've come. That's a great pasta dish that I can serve my teenage sons, thanks! Great advice. Gradual changes are easier to maintain too! Fantastic post, Lauren! My daughter brings her lunch to school, and I'm so proud every time she packs it. I hope she'll grow into a teenager as wise as you. As always Lauren, you're wise beyond your years! I'm glad you convinced your friend not to do the fast and to make healthy changes instead. You're a budding nutritionist! I love your attitude. You're very inspiring. Thanks for the tip about keeping it simple. It helps us not feel overwhelmed by the changes we have to make when we are confronted with a change in our eating habits. Keep up the good work. 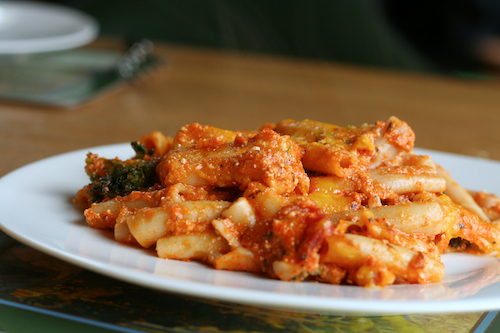 I'm heading upstairs right now to make a vegan version of your pasta bake! That’s great advice for teenagers and adults alike! All the adults who are eating at fast food restaurants everyday for lunch would certainly benefit from your tip! 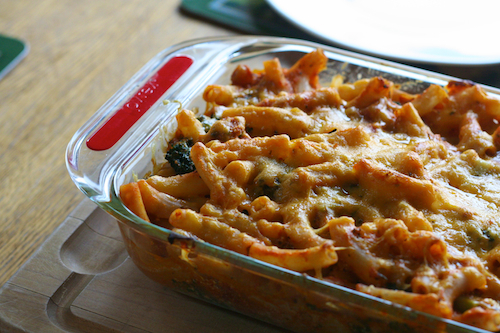 Taking leftovers of that Pasta Bake for lunch sounds like a good idea to me. Jenny – Yes! You're exactly right =). Alison – Yeah, it's pretty cool =). I haven't actually had anything from it yet, but it's really nice to know that it's there! Melodie – Thank you! I hope that you enjoy it! Maggie – Apparently so. I don't really understand why, but people think the quick fixes will yield quick, long-lasting results. Michelle – Thank you! I hope that you enjoy it =). Shirley – Thanks =). Yes, that would be so cool to have them in airports! So far, I've only seen the one at my school. Kelly & Mama – Thank you both! Christa – Thank you so very much =). Stephanie – I really like pasta bakes too. They are so simple, yet have so much possibility. That one you made sounds absolutely lovely! Sara – Isn't it lovely to cook when you're little? I've always been so happy that my mom did that =). Thank you! Alta – Thank you! Yes, it's pretty cool =). I love that the option is there! Kelly, Janette, Jenna & Hallie – Thank you so much! Shaina – Thank you! That's wonderful that she makes her own good lunch =). Iris – You're making me blush! Thank you =). Ellen – Thank you! I can't wait to see your vegan version – we absolutely loved this one =). Heather – Thanks! Yes, the pasta bake is great reheated =). My friend made it and brought the leftovers for lunch too! Lauren- thanks so much for your post! My son is three and I know he'll be just fine growing up with allergies/intolerances, but it's always nice to hear from someone who is doing an amazing job living gluten-free, or free of whatever allergens they may have, thank you! You write well, and have a good head on your shoulders. Laureen you never cease to amaze me – such common sense. Snacking on veggies while making dinner or before is a great idea! Lauren, I had postural hypotension too (cardiologist told me to eat 2 tablespoons of salt per day when 1 tablespoon wasn't enough) but now that I've been GF for over 6 months, my blood pressure is normalizing. I'm down to just a dash of salt a couple times a day. I hope you can eventually cut down too.